Prep Day: Scrub and pierce potatoes. Bake at 400F for 45-55 minutes or until tender. Meanwhile, remove papery outer skin from garlic bulb (do not peel or separate cloves); cut top off bulb. Place on a piece of heavy-duty foil; drizzle with 1/2 teaspoons of oil. Wrap foil around bulb. Bake at 400F for 30 to 35 minutes or until softened. Cool for 10 minutes. Squeeze softened garlic into a large mixing bowl. Cut potatoes in half; scoop out pulp and add to garlic. Discard potato skins. 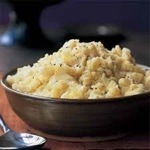 Mash potatoes. In a small saucepan, saute rosemary in remaining oil for 2 minutes; add to potato mixture. Add milk and salt; beat until fluffy. Place cooled potato mix in a large freezer bag. Serve Day: Thaw. Heat in microwave covered until heated through.